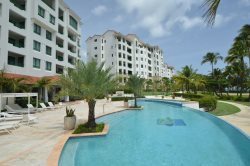 This property is located at Reina del Mar Condominium in Isla Verde right by high end hotels, casinos, restaurants, and shops. It has two bedrooms, 1 bathroom, fully equipped kitchen, living room and balcony with ocean view and beach front. TV's in all rooms and WiFi. The location is just 5 minutes away from the San Juan international airport, a 20-minute bus ride to Old San Juan, easy accessible to el Yunque rainforest and within walking distance of the best hotels of the area, The Ritz Carlton or El San Juan Hotel, that feature casino, restaurants, and much more. From the open-air balcony, sit and enjoy your morning coffee or afternoon drink, and enjoy the stunning panoramic views of the beach. Our condo has 2 bedrooms and 1 bathroom. Master bedroom has a queen bed with TV/Cable and Internet throughout the condo. Second bedroom has 2 twin beds with TV/Cable/DVD. The kitchen is fully equipped with oven, stovetop, refrigerator, microwave, dishwasher, toaster, blender and all cooking utensils. Unit also has a washer/dryer. Dining Area has 4 stools in kitchen countrtop, living room has seating for 5 guests. The condo is equipped with linens, and bath/beach towels. A/C throughout the condo.